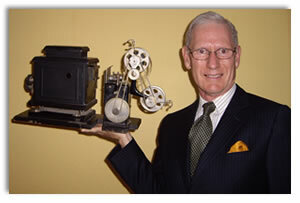 In 1971 I founded Kit Parker Films, a 16mm non-theatrical film library. Later we expanded into 35mm distribution of major studio classics and specialty films to theaters. We also co-produced television programs and released home videos. In 1999 I saw my first DVD; amazed by the quality, I knew right away the days of film libraries were numbered. The next day I started the long process of closing down my film exchange. It was a blessing in disguise. This allowed me to concentrate fully on my passion of locating and restoring "orphan films", movies that have been out of sight for decades. I became a detective on a mission to locate the owners of these "orphans". It involved a great deal of sleuthing and patience as the original producers and copyright owners were long deceased, and the negatives scattered around the world. My success has been gratifying, and wouldn’t have been possible without my life-long interest in the historical aspects of independent producers, the distribution of their movies, and the physical properties of motion picture film. My library has grown to over two hundred feature films and as many television episodes, literary and other properties, all protected by copyright. I am always approachable, so feel free to ask me questions or make comments.